I got summer on my mind and so does the temperature here in the northern Indiana (in the nineties). Hanging by the pool, attending cookouts, picnics, outdoor parties, and other food-related gatherings are my favorite summer activities. 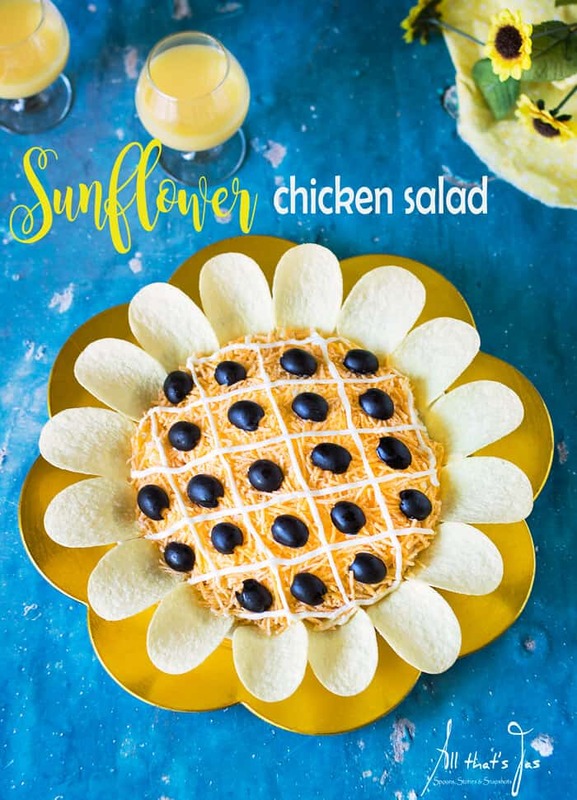 The sunflower design of this chicken salad with its bright and sunny mood has summer written all over it. Undeniably, it has stage presence and it steals the show. Follow this basic recipe or feel free to use your own favorite chicken salad recipe. In a medium bowl, mix chicken, celery, onion, sunflower seeds, and mayo; season with salt and pepper. Place the salad in a serving bowl; layer the top evenly with the cheese. Put a tablespoon of mayo in a snack-size Ziploc bag. Cut a small hole in the corner of the bag. Squeeze the bag with light pressure until mayo begins to flow out. Continue to squeeze gently over the salad as you create the checkered pattern with horizontal and vertical lines (if the mayo you’re using doesn’t flow easily, mix in a few drops of milk). Drain the olives and cut in half lengthwise. Place one half in the middle of each square. Refrigerate salad for at least 2 hours. 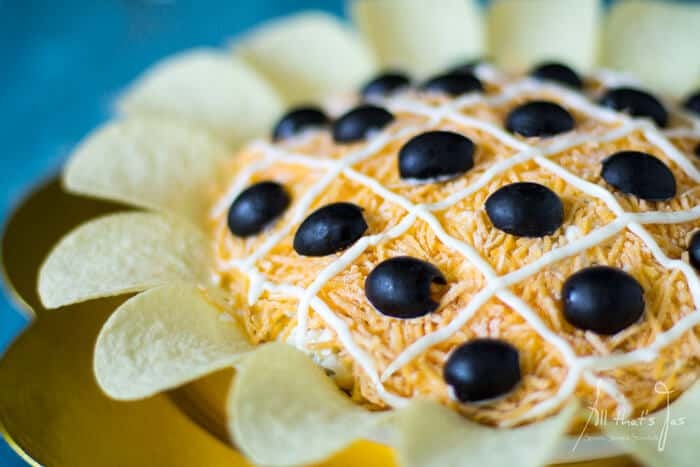 Before serving, decorate with chips. I served this salad at my granddaughters’ secret garden birthday party. Check out other cool food I served and how I decorated for the party here. 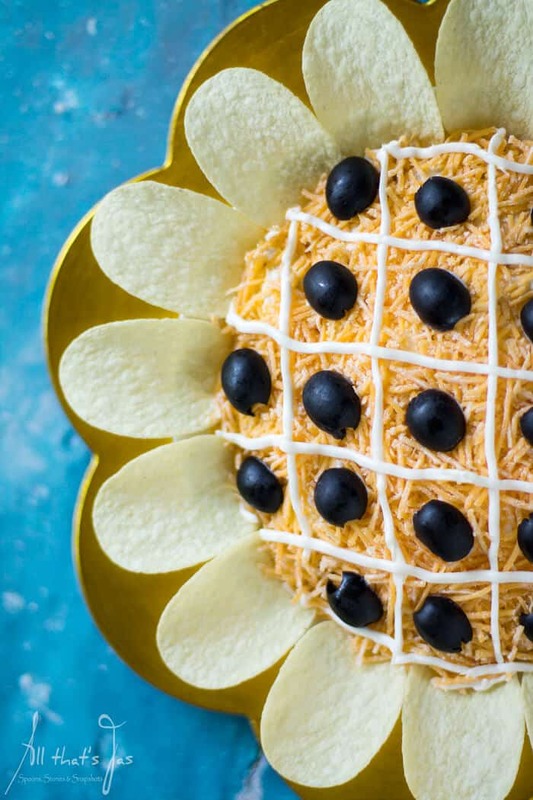 The fun sunflower design of this simple chicken salad goes hand in hand with your summer BBQ. 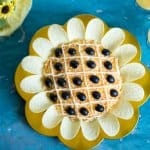 Use an egg, tuna or other creamy salad of your preference and assemble it to look like a sunflower. I can’t eat that, Jas! You made it look so pretty! This is so much fun! Too pretty to eat – but not really, I’m sure. I love it when someone takes a little extra time for festive and seasonal presentation. Thanks for sharing this cutie. I’m stopping in from Lisa’s Grand Social where I always find something great to take away and try. Thank you, Barbara! 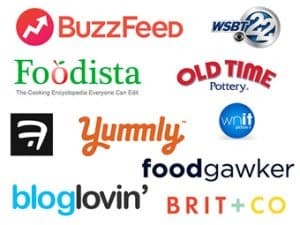 I agree with you about finding something new – just when I think I’ve seen it all, someone shares a great idea, recipe or a project. It’s so fun 🙂 Hope your week is amazing! I love to see pretty food. This is a great sounding recipe. Thanks for sharing at What’d You Do This Weekend. You will be featured next Monday. Thank you so much, Linda! I’m honored 😀 Have a great day!!! Such a fun and beautiful presentation! Thank you, Mistie! Have a grand weekend! 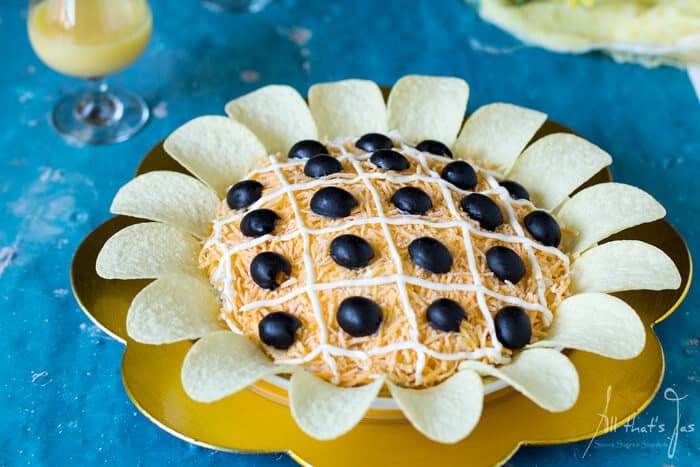 Lovely and fun presentation of a chicken salad! Thanks for sharing it at #ThrowbackThursday! Thank you, Ahila! Have a lovely weekend! This looks so retro! Wouldn’t it be cute for a shower? Thanks for sharing with us at Throwback Thursday!! What a lovely idea, the salad looks so so yummy AND amazing! 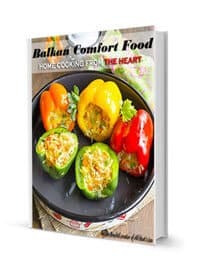 I love summer hangouts with friends and we are always out and about, so this will definitely be a great addition to any picnic or BBQ!!! Thank you, Katrin! So glad you like it 😀 Have a great summer and thanks for stopping in! 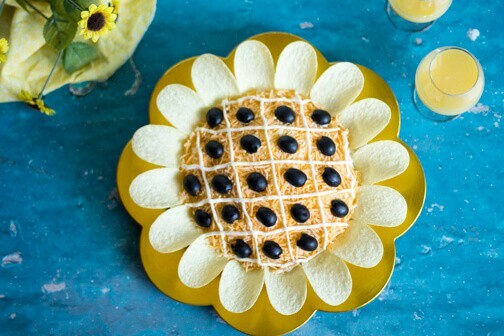 What a pretty way to serve chicken salad! What a clever dish Jas! 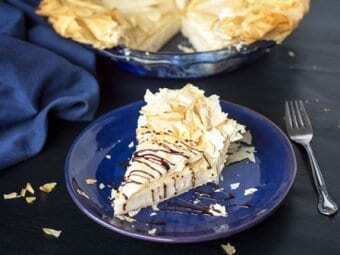 Love the presentation and reading the ingredient list I know that I would just love this. Pinned and tweeted! Thank you, Bobbi! Takes a little effort to dress up a simple dish 🙂 Are you coming to the Sates in November again?